I'm going to take a bit of a break from blogging for a few weeks and I hope you will understand as I try and recoop, regroup, readjust, recharge, recover and just plain relax. This is the perfect card, don't you think for quilters and sewers? My niece Jennifer made it and sent it to me for Christmas. I think she knew how much I would appreciate the sewing theme. 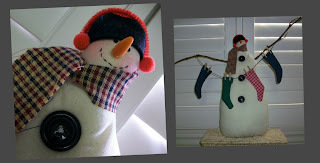 Here are the latest Snowbound snowbuddies from Bunny Hill Designs, that I managed to get finished. How does she think this stuff up?...she must lay awake at night creating. They are adorable and I need just a free afternoon to finish the last 5 of them. I've chosen white with red and white with blue polka dots for the corresponding blocks that are set around these little guys. It should look wonderful when it all gets completed. Thank you Bunny Hill Designs for sharing such a beautiful project with all of us. I'd say I got the best Christmas exchange ever when I received this beauty. Lori a quilter that brings me her quilts to long arm, brought me this quilt top and another with a unusual request. 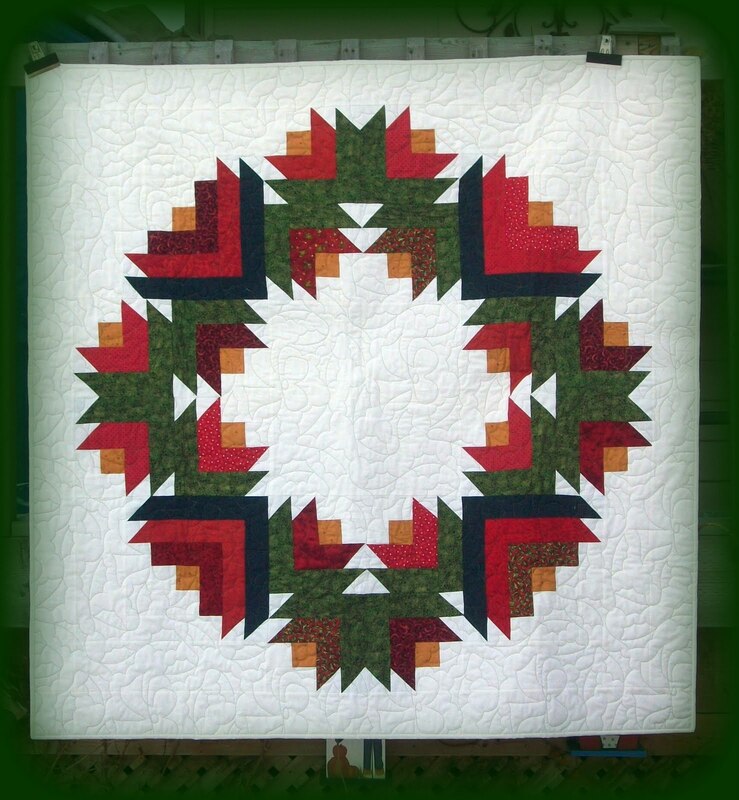 She asked if I would quilt her one quilt top for free in exchange for this wreath quilt top. I had never been asked a request like that before but the quilt top was beautiful and I agreed. I think I made a great trade. 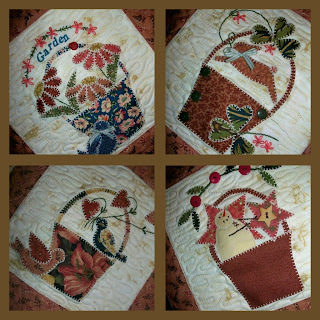 I quilted and finished it sometime back and it is one of my favorites. It hangs folded on my banister year round. Thank you Lori for my special trade. 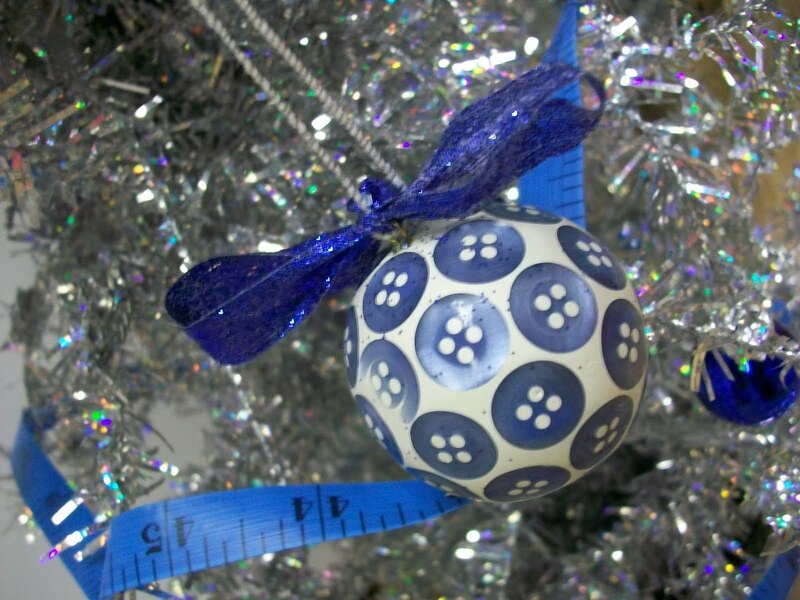 What do you get the quilter who has everything for Christmas? too. She did them up for a local bazaar she had a table at and they sold like hotcakes. 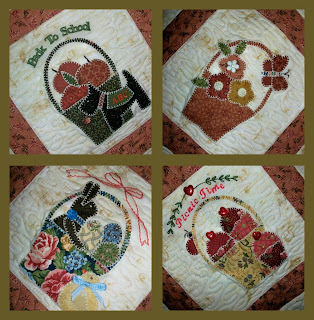 I added a little quilter charm to each one and gave them as gifts to my Mystery Class ladies. These are definitely for the quilter who has everything! I want to thank Bunnyhill Designs for her generosity in providing these lovely BOM's for everyone to share and enjoy. I've had so much fun doing them and can't wait to get them all finished. I'm a little behind as usual and I still have 4 more to finish. You know how you just need one afternoon to yourself....I just don't seem to get that and that's why I'm so far behind. 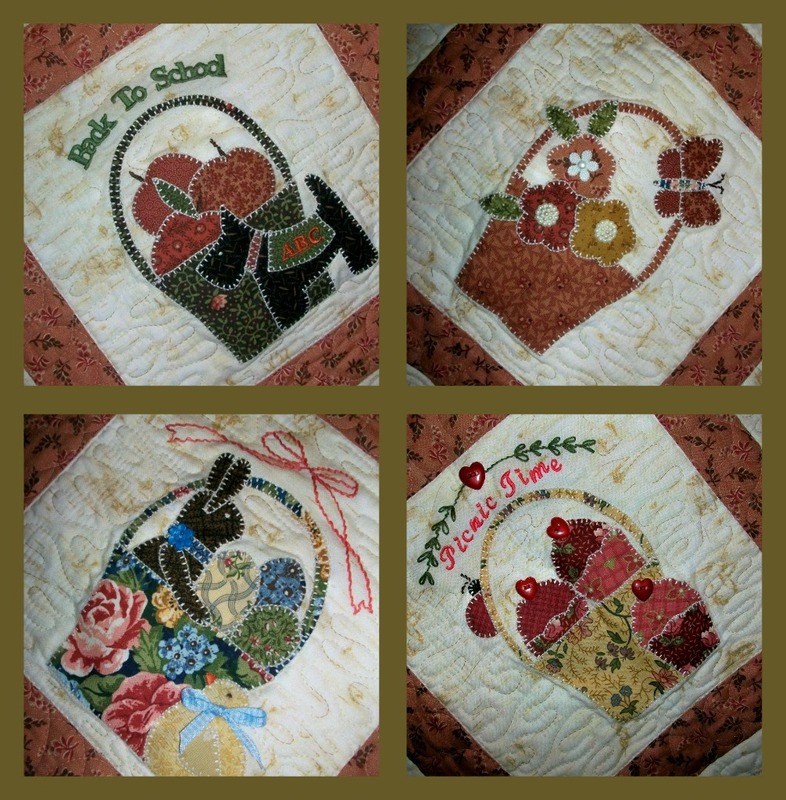 I can't wait to get the last few done, it quilted and then all the lovely embellishments added. It's going to be so cute. Hope I get it finished before spring arrives and melts all the snow. More than these marshmallows are melting! Frosty doesn't hold a candle to this guy! 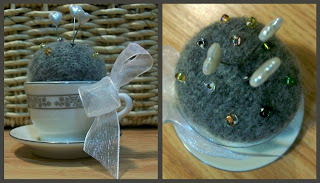 (no pun intended) I had so much fun making a pin cushion out of this tea light holder. It's amazing what you can come up with when you let your imagination run wild. I really should put a leash on it and get a life like my friend Sue says. I guess I have just too much time on my hands since I retired. He is really adorable and just in time for the winter season. 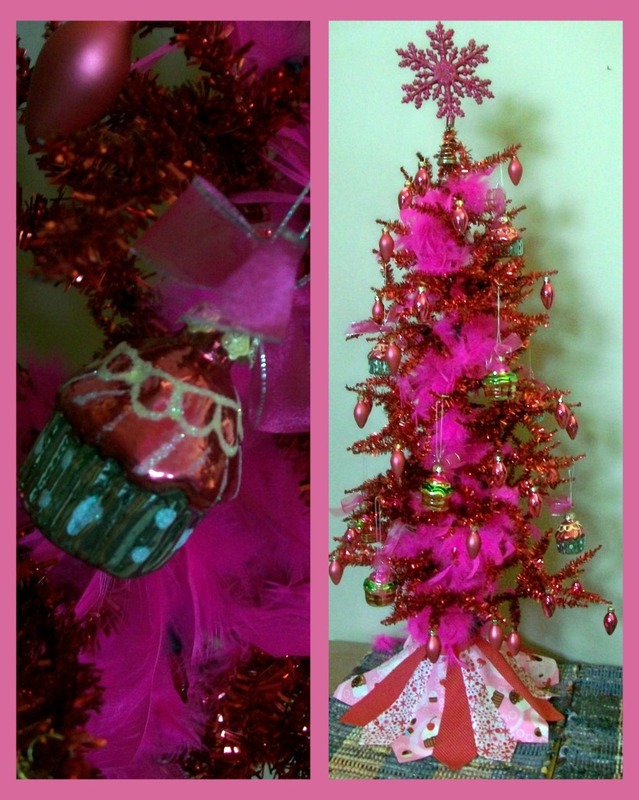 I love themed Christmas trees.....can you tell? This one is really sweet, literally. It's my cupcake tree and it proudly sits in my kitchen of course. 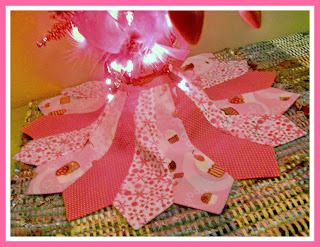 I made the little Dresden plate tree skirt out of matching pink and red fabric and one of the fabrics has little cupcakes on it. It looks really sweet at night when the red lights glow and the little red tinsel tree shimmers all over. Almost good enough to eat. Yum! 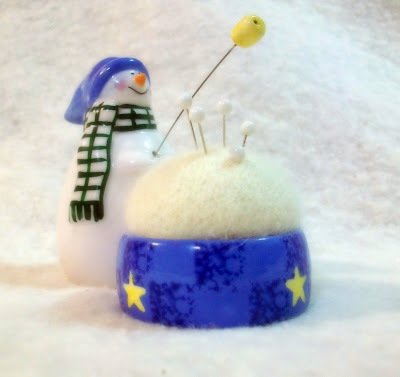 It just wouldn't be Christmas without a Santa pincushion, would it? 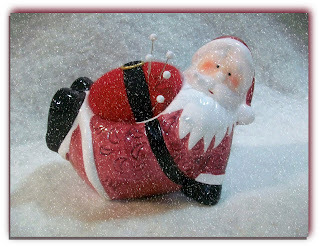 I love this little guy, looks like he slipped on the ice and snow. I almost felt funny sticking pins into his belly, sort of made me feel like he was a Voodoo doll.....OMG... I hope I haven't ruined Christmas! Should I sleep on it or eat on it? You think your hubby doesn't notice things right?....not....It's amazing what they do notice when you don't want them to. I had wanted to do something a little different over Christmas in my kitchen. I wanted to brighten up the table and add some pizazz to the room, however could not find just what I was looking for, so kind of let the idea go. Later I was rummaging around in the linen closet and came across an unopened duvet cover in red and white that I had bought years ago for about $10.00 from Ikea. It was suppose to be for one of our girl's bedroom but never made it onto the bed. As I looked at the package, I thought that it would make a really cute table cloth for the kitchen table. It was 100% cotton, there was lots of fabric cause it was a duvet so there was a top and bottom and it had been a king size cover. 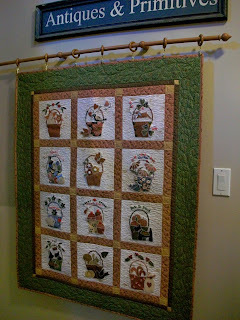 I loaded it on the longarm, thought why not and quilted it in a YLI variegate of red, pale yellow and pink that I had never tried before and a new pantograph called Holly Berries that had just arrived...It quilted like a dream and I love it. While I was quilting my hubby lets me know that it's time to pick up our youngest son. I tell him that I have just a half row to finish on this tablecloth and he turns to me and says "Tablecloth? looks like an old bedspread." I thought I was going to kill myself laughing with this one. He never notices anything. I could come home and change the cut and color of my hair and he wouldn't notice or say a thing....but he can suddenly tell the difference between a bed cover and a tablecloth....LOL... love it anyway, didn't cost me anything, brightens up the room for Christmas and I love my trifle dish filled up with matching ornaments! "Santa, I've been a good Westie"
I was out shopping recently and came across this glass Christmas ornament that looked like my dog "Jock". I couldn't resist. The resemblance is remarkable don't you think. 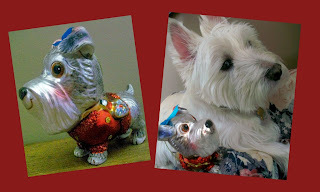 I don't think Jock was impressed, but this new little Westie will look lovely hanging around during the Christmas holidays. I made this sometime back, but it's still one of my favorites. I especially like the fabric in the blue/green mittens because it looks like needlepoint and is so pretty. Each of the cuffs is done in chenille fabric so it feels fuzzy and looks like wool. 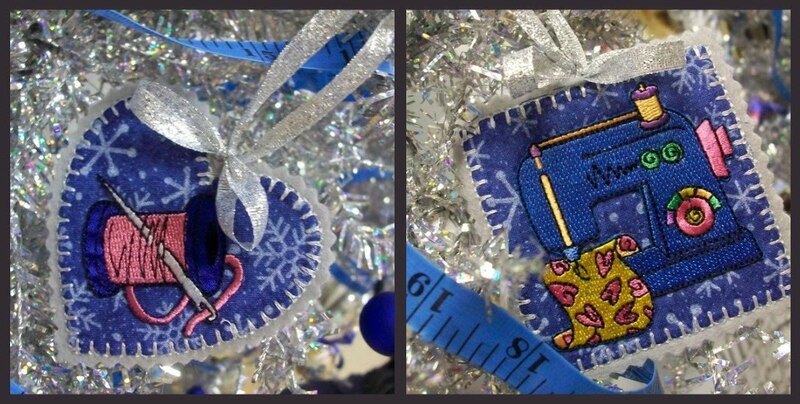 The little heart appliques are a perfect touch. how cute is this. 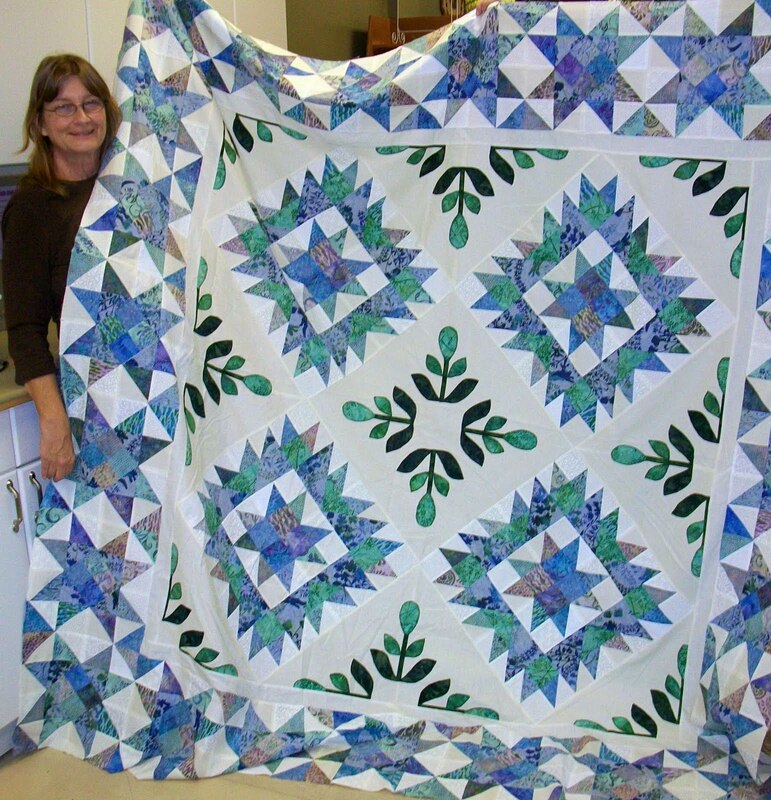 It's hard to believe that this was the first quilt of a 13 year old teenager named Erica....wow...look at the flying geese!...her first quilt. She's a natural. Isn't it a great quilt for a teenage girl....just perfect. Erica did an amazing job on this quilt with a little help from Pam, her quilting mentor. She should continue with her quilting talent, and I have a feeling that in the future we might be hearing alot more about a girl named Erica when it comes to designing. You can almost smell the sugar and spice, can't you. The perfect man of course would be the gingerbread man! 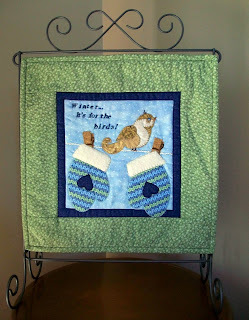 This lovely little mini wall hanging was designed by Nancy Nigh. How sweet and super simple to make, just like gingerbread cookies. 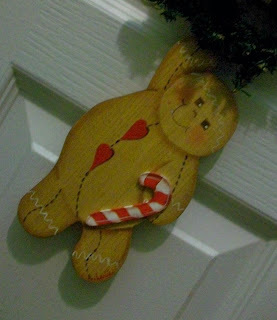 I love the matching gingerbread man hanger that goes with it. It's so much fun to get the season's special things out to display. Isn't this a beautiful quilt. I had the pleasure of longarming this for Linda. 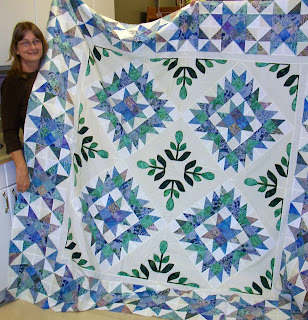 She is an amazing quilter, pretty well self taught which is amazing. Her quilts are precise and an absolute joy to quilt. This is lovely with each wreath a different fabric and all the fabric had a beautiful hint of gold in it. 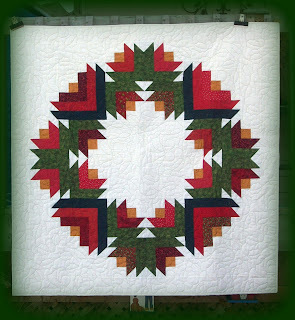 I think this is a Thimbleberries pattern from one of the older books that they published, however still perfect for the season. I think this is my favorite tree ever! It's my snowman tree complete with snowman tree skirt. Every ornament on the tree is a snowman or snow themed ornament collected over the years. The whole tree is done in various shades of blue, white, and silver. It looks phenomenal when the lights are turned on. Can't believe that Christmas is almost here. It's such a short time to enjoy all the wonderful Christmas things we do... make....and bake. Ok, now that we have arrived in Punta Cana for a week's relaxing vacation, it can snow all it wants at home. When we left it was freezing and all I could think of was miles of beach, unlimited pina coladas and not having to cook. Now that we are here, all I can think of is the kids, the grandbaby, the dog, my mother, did the kids eat, did they feed the dog, did they lock the door, did they turn off the stove, hope they didn't overload the washer, did they pick up the mail, did they set the alarm for school, did they have breakfast, did they take a lunch, are they sticking to curfew(yeah right), did Nick get to hockey ok, did they have the proper supper I had set aside, OMG....I need another drink "Camarero por favor, puedo tener otra piña colada ". 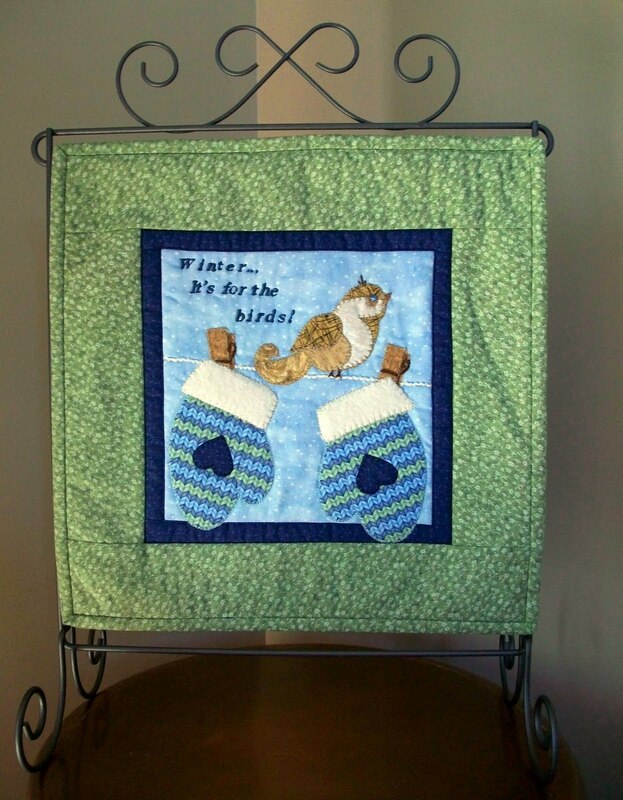 This little number was a mini wall hanging designed by Nancy Nigh. Isn't he sweet. I love the little hanger complete with it's own snowflake. Here are my angels.....Sharon, Fran, Charlene and Nancy. These ladies took my recent "Holly the Christmas Angel" class offered at Kindred Spirits Quilt Co. It was a sculpted doll with quilting and patchwork featured clothes and wings. They worked very hard at getting her pretty little "angelic" face just perfect. (you should have heard some of the comments....the pearly gates would have closed up permanently with Charlene's alone..LOL). 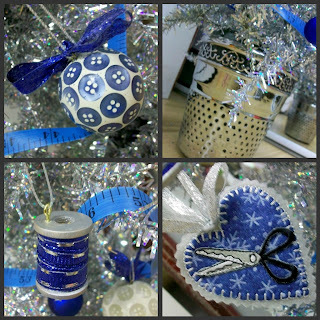 They all looked so individually beautiful and will be a wonderful addition to their homes over the holidays. The doll was anchored on a 1.5 litre bottle of wine which was to accompany them to class empty. I think that the ladies would have preferred to finish the bottle off during the face sculpting class instead. Way to go ladies, and thank you for making it such fun for me! I received this quilt from a Elizabeth in Yellowknife, NT to long arm quilt. What a beauty! It's all flannel and the backing was this gorgeous leaf patterned flannel that looked like it was crewel work. Amazing detail on fabric. Needless to say Elizabeth is gonna need this flannel quilt cause the temperature in Yellowknife is a balmy -18 C....yep you read it correct...that's a minus 18. I just dreaded this call...I have a quilt that I need long armed, and it's minky fabric......()*#! )(&$&%_*!_My worst nightmare, my biggest fear....the dreaded Minky. 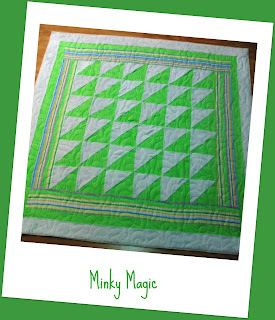 Don't know why I fear it so much, maybe because it has a tendency to stretch a great deal, maybe because I've just not challenged myself to put one on my machine.....So I stretched myself and agreed to quilt this baby quilt for my customer...it wasn't all minky, the white is minky and the green was flannel. The challenge was not so much the minky fabric but the flannel and minky together where points did not meet perfectly and there were quite large lumps to try and quilt over. It is complete, customer pleased and one little bundle of joy will be warm and cozy wrapped in it. I had quite a few of these lovely little china teacups leftover from my daughter's wedding. Her theme was " Love is Brewing" and these were the favors for the lady guests. 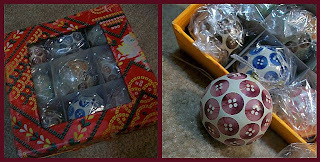 They've turned out to be a ton of fun for me and make the most perfect mini pincushions for friends or giveaways for the quilting classes I teach. This one turned out sweet with it's little grey felted ball and the delicate beading added to the top. 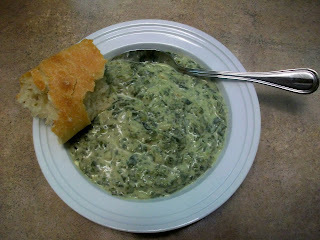 A while back we were in Watkins Glen and I had the most fabulous spinach feta soup there. I was determined to re-create that wonderful dish when we returned home. In my quest I came up with the following recipe for it and it tastes wonderful. My daughter wants the recipe too so it must be good cause she's a picky eater! Cut up raw bacon finely and brown bacon in a stock pot, add garlic diced celery and diced onion and saute all with a knob of butter. Peel and dice two large potatoes and add to the mix. Saute 5 minutes. Add chicken broth and bring to a boil. Turn down heat and simmer until potatoes are tender. Cook the spinach and drain well. Chop into small pieces. Add the spinach, nutmeg and Worchester and continue to simmer while stirring well. Add the feta cheese and cream cheese and stir until melted. Add the cream, stir well and simmer for 5 minutes…..eat and enjoy! I feel an idea coming on! I was surfing Ebay recently and found these cute button holiday ornaments for sale.....hmmmm, what can I do with these? It's rare that you can locate sewing themed artifacts, so when I saw them I went for it and purchased them. Then I let my mind wander as to what I could do with them when they arrived. How many times have you seen something, debated, not purchased, then after going home, come up with a brilliant idea, went back, and it was gone! Ya...me too. So now when I see something, I get it, then worry about what I'll do with it after. It never fails that I come up with some creative idea to use the object.....I feel an idea coming on for these cuties! My mom and I go out on Wednesday afternoons...that's her time with me. We do lunch then try and find interesting things to do together. Some times it's art galleries, sometimes it's shopping, sometimes it's doing errands that she can't manage on her own. We ventured off to a little village called Ridgeville on Wednesday and they have 3 little shops that are themed for the season. I found this flour sack tea towel with the dog and wagon imprinted on it and thought it was so cute. I stopped by Michael's, picked up a frame and stand, came home, cut and cropped the towel, added a little batting behind it and it turned out sweet as Christmas pudding. 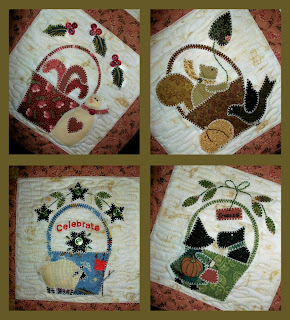 Well it took a while but I finally finished and quilted my Tisket, Tasket Baskets free BOM by Bunny Hill Designs. 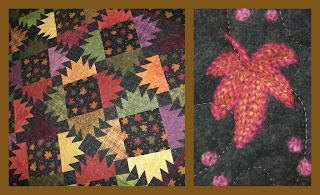 I was able to use scraps from the many Thimbleberry projects I have done over the years and I think it turned out great. What's even nicer is that this is one of my first custom quilts done on my long arm and I can say that I'm happy with how it turned out. I was able to stitch in the ditch quite well, and did do a feather border around the edge even though it's not perfect it's a good attempt and good practise for me. Don't think I'm running right out to do more customs but it was a good learning. 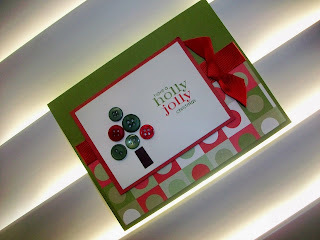 Each month I join in a Stampin Up Card club class and we make 3 projects in an evening. 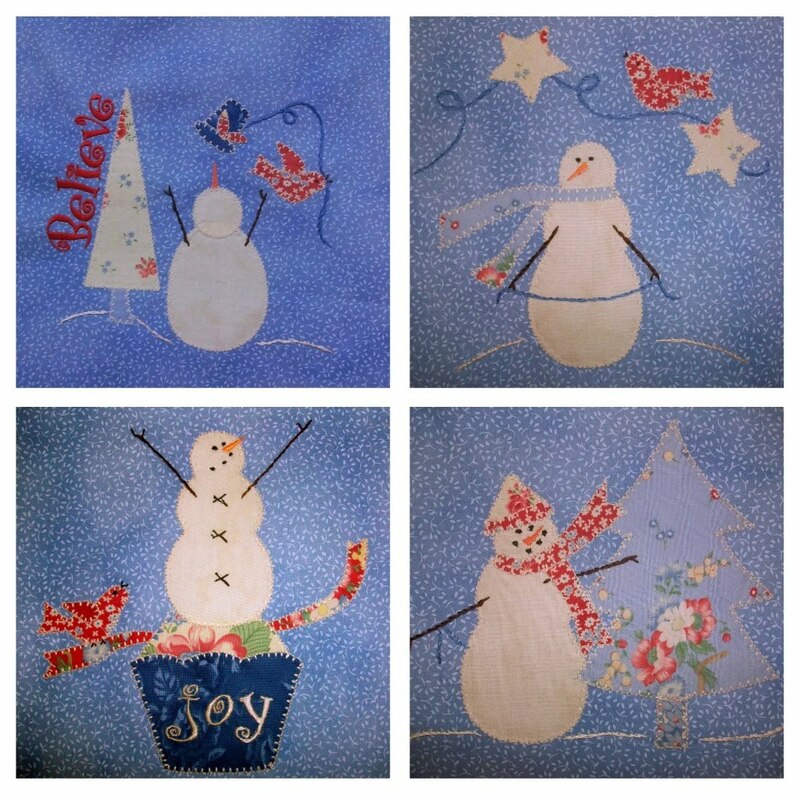 It's a great deal of fun and the projects are themed to the season and of course with winter and Christmas upon us we made these delightful projects. 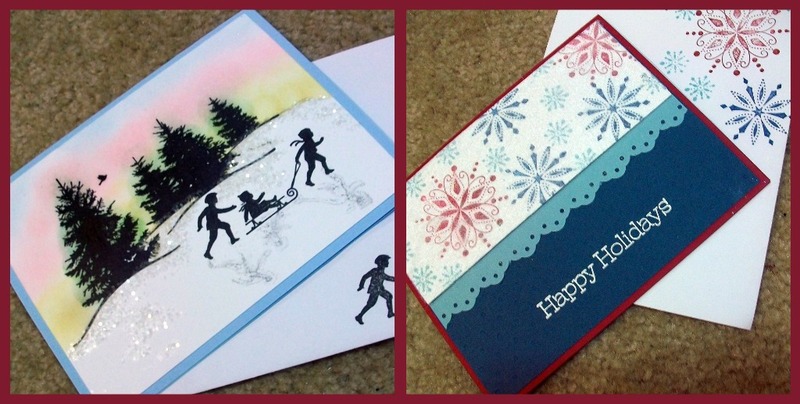 The top two are nice Christmas cards using different techniques which is always fun to learn something new. 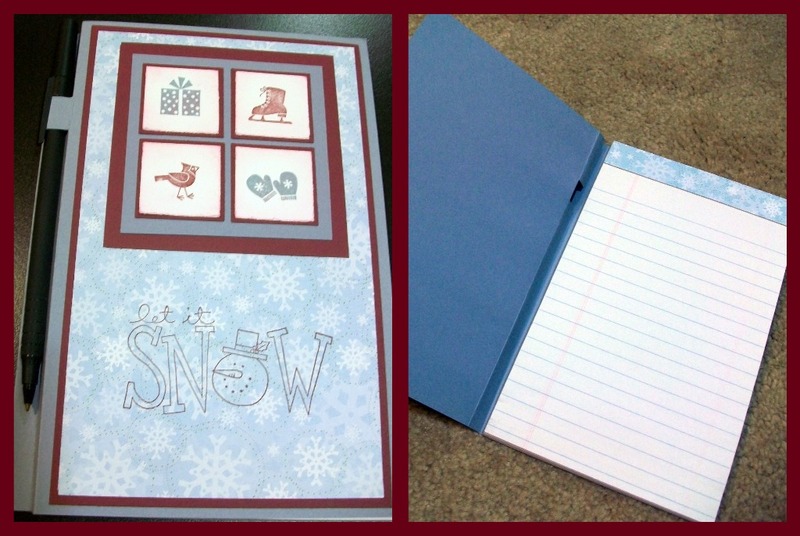 The bottom one is a Christmas note book which will come in very handy to make to do lists or jot down notes. When we were in Montreal I was in a department store looking around and came across a fabulous scarf. I just loved it and was going to purchase it until I looked at the price tag....OMG $55.00...I don't think so. I opted to have a better look as to how the scraf was made. It was a simple flat scarf and they had sewed rows of elastic which gathered up the scarf and gave it these beautiful ruffles. You could just wrap it around your neck and all the ruffles sat wonderfully around your shoulders and tucked without difficulty into your coat. That of course got me to thinking....I should be able to do this myself. I purchased elastic thread which I pulled tight as I wound it onto the bobbin of my sewing machine and used regular thread on the top. I simply sewed three rows of stitching down the length of the scarf and voila, it ruffled like a charm....I love it and I saved $55.00 which I can now buy more stash with! These are the new group of ladies that have signed up for Mystery Club for the 2011 season. The mystery club is offered at Kindred Spirits Quilt Co. and we meet the first Friday of every month. The pattern we are working through this year is Border Creek Station's Quilter's Journey, with the option of Travel by day or Travel by night. Each month students are given new clues to work on with their fabric selection and it's not until the end of the installments do they know what their quilt will look like. So much fun and we have a great group of ladies including Pat, Rene, Audrey, Arden, Donna, Kathleen, Carole and Barb. This is my friend Pat's finished mystery quilt. Isn't it to die for? 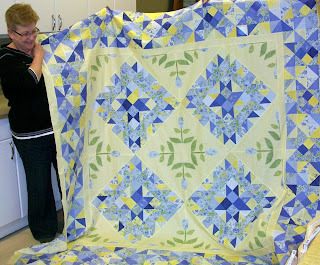 I love blue and yellow together and this quilt is an absolutely stunning mix of the two. 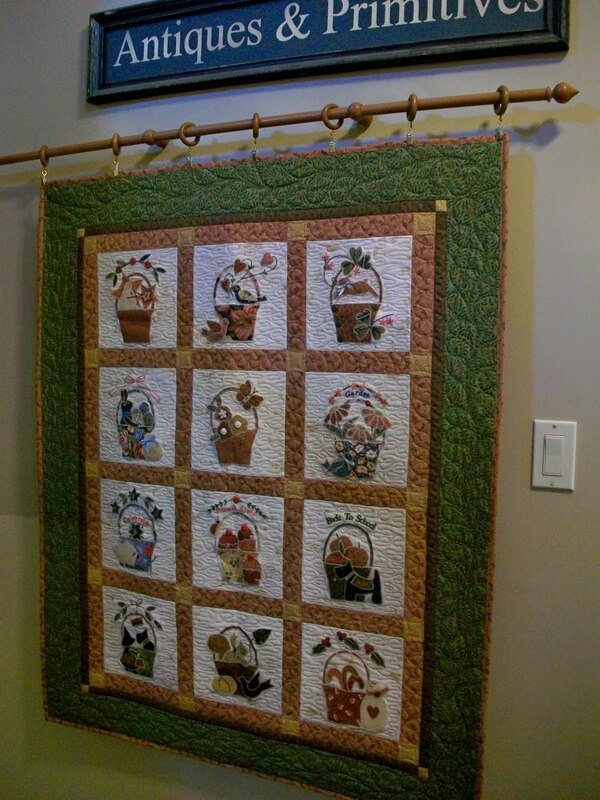 Pat's been quilting for only a few years and I think she did an amazing job on this beauty. This will look wonderful on her bed any time of the year, but can you imagine this on the bed on a breezy warm spring day.....Oh I wish is was mine! This is Kathleen's finished Mystery quilt. What a beautiful quilt all done in batiks. Kathleen comes to the class with her friend Carol and they both did an amazing job of their quilts. I love the blue and green jewel tones she chose. I would love to have this quilt gracing my bedroom but somehow I don't think Kathleen would be willing to give it up. This is Barb's completed Mystery Club quilt....oh what a beauty. 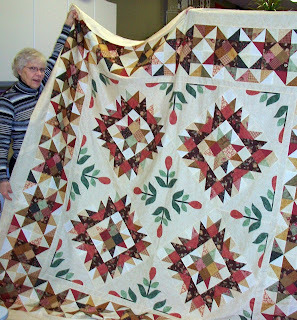 It is wonderful and I love the fabric and color choices she made. Barb took the class with her daughter Debbie and her granddaughter Leigh so it was a real family affair. In the fabric line was a gorgeous apple print which just makes the quilt look delicious. It's so rich looking and so country.... I want it, I want it. Am I working them too hard?....Look- they didn't even look up when I took the photo. These lovely ladies are Bernadette, Jane, Liz and Kathie and they are my beginner students at Kindred Spirits Quilt Co. By the way they are in the beginner class, but they certainly don't quilt like beginners. They are doing amazing and their quilts are looking amazing too! I'll be sharing their finished projects with you shortly. At our mystery club class at Kindred Spirits Quilt Co. we like to have fun and we love to have fun with food. In addition to the monthly class students get special treats along with recipes, taste tests and giveaways...no wonder they keep coming back. One year the theme was cakes, then tarts and last year it was loafs. This year the class wanted cupcakes, so cupcakes it is. Each month they get a cute little recipe card in a special wrapper and a holder to keep all the months recipes in. Then I make the cupcakes and bring them in so the students can sample. This month I wanted a fall themed cupcake so the recipe was Butterscotch Bundt. I dressed up the cupcake with a leaf cut out of rolled out tootsie roll and an acorn moulded out of a caramel, dipped in chocolate then dipped again in chocolate sprinkles. Mmmmmm good. 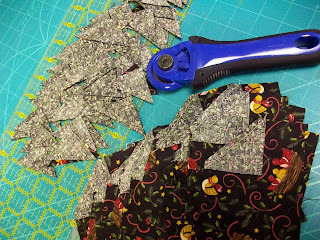 As I was cutting off the corner diagonal of the block and accumulating a pile of cute little stacked triangles it occurred to me "waste not, want not". 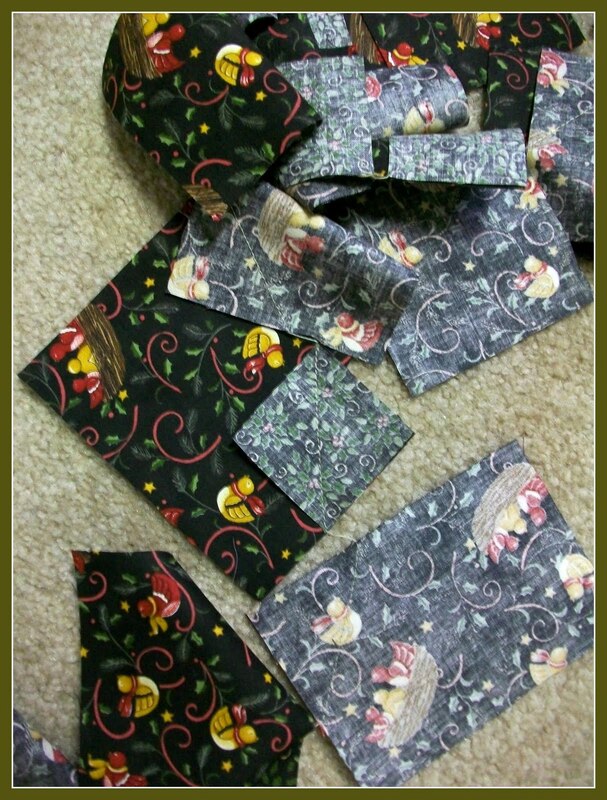 I really could make use of these things....they are already to go...just have to sew down the side, cut them with my "quilt in a day" ruler and voila...itty bitty half square triangles. So that's what I'm working on....as if I don't have enough to do....but I have always wanted to do a miniature quilt and this seems like a perfect opportunity...I'll keep you posted on this "little" project. I've been working on my mystery quilt and "chain piecing" like crazy. Part of the quilt process is to sew these little 2 inch squares diagonally onto the 3X5 rectangle......96 times! 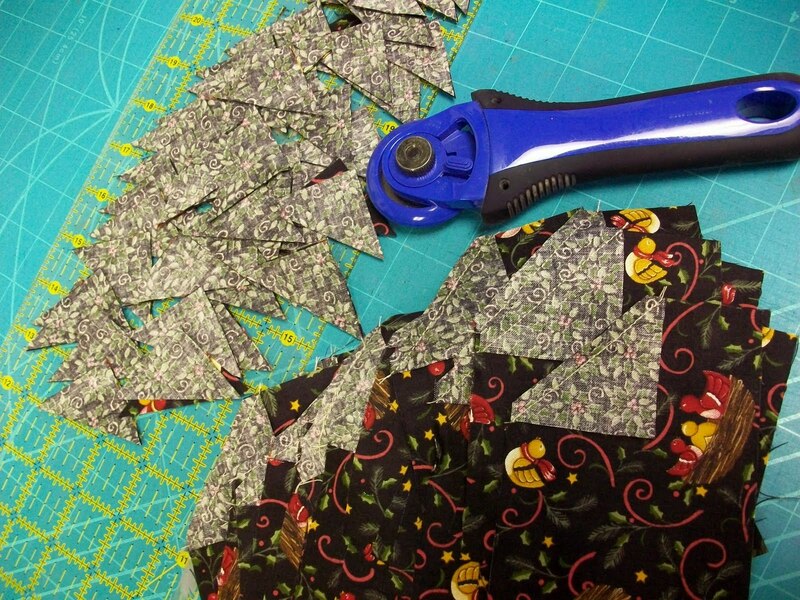 Tedious, but chain piecing helps. Can't wait to see what next month brings as a clue! 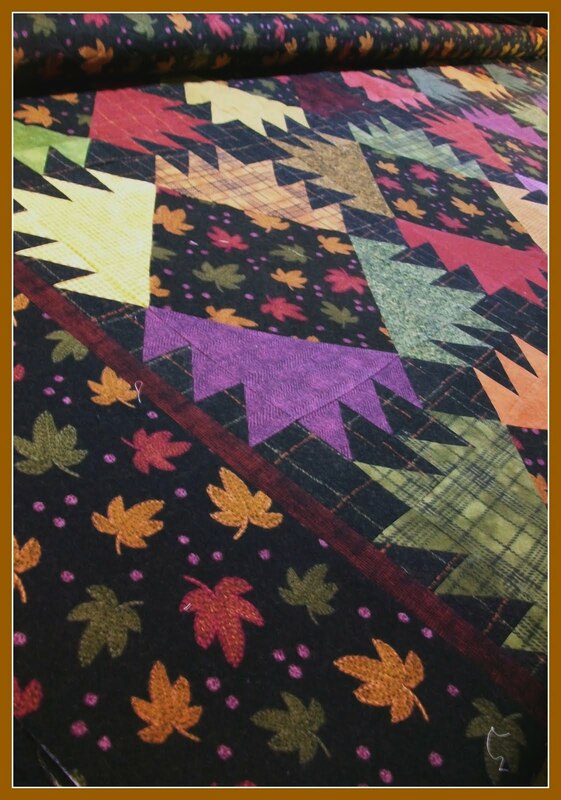 This is a quilt brought to me by a customer to longarm. It is so simple but so effective and such a pretty patchwork. She made it from mostly Thimbleberries scraps and it looked amazing, but I'm partial to country colors anyway. 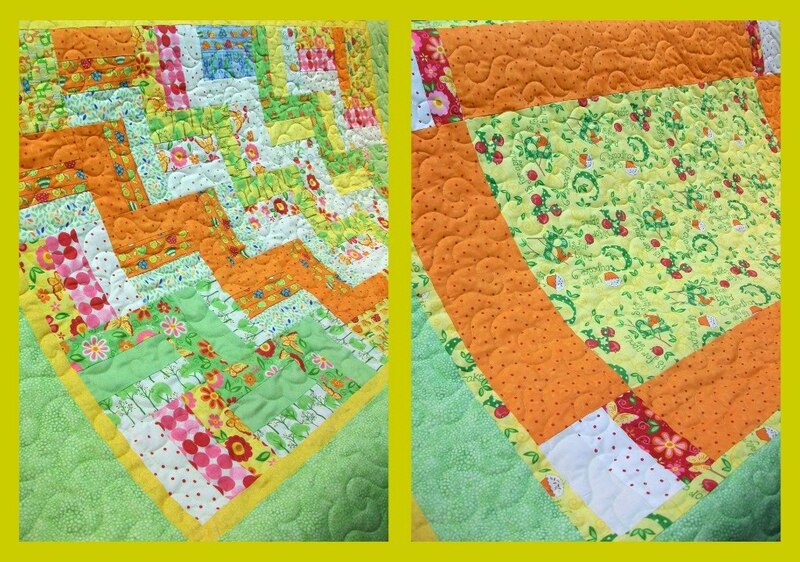 I quilted it in the panto Happy Times which looks great on just about any quilt. 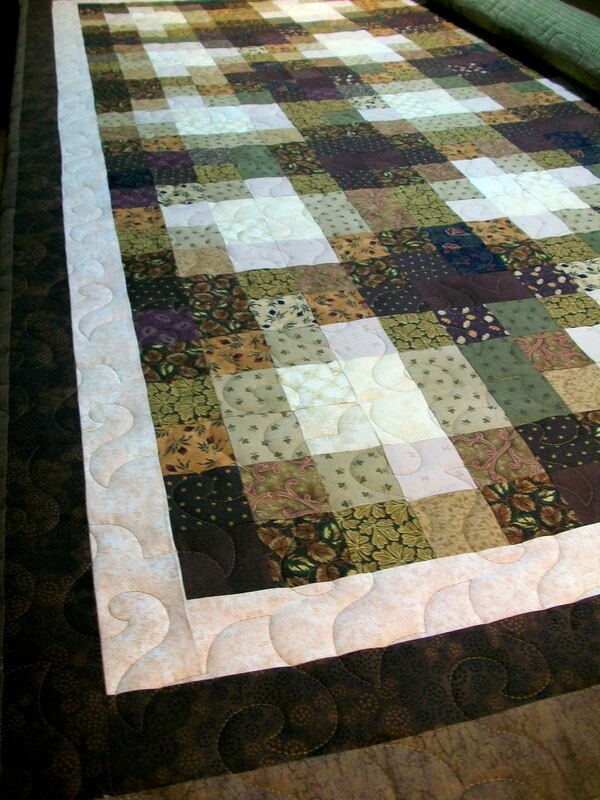 She had chosen flannel for the backing so it's a wonderful and cozy quilt for her living room. 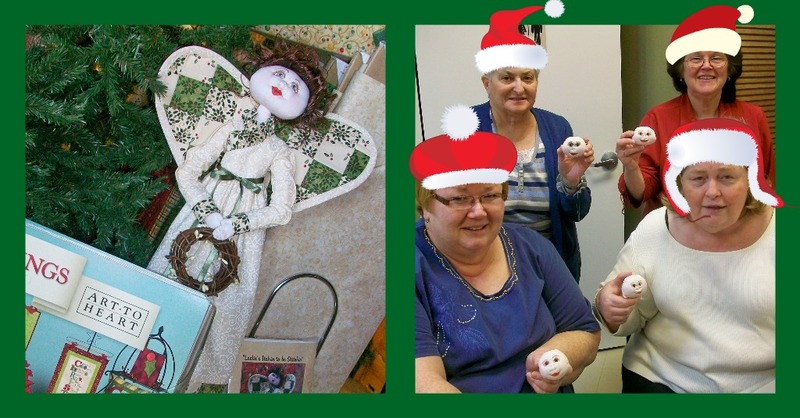 Recently I had the opportunity to join Maureen Augerman at her monthly doll class. It was so much fun and we each made this lovely little snowman named Gus. The pattern is from Threads That Bind and he was super easy to make with his unbleached cotton body, sew on buttons, pipe cleaner and pom poms for the ear muffs and the cutest little clothesline holding his stockings. Maureen's daughter Karen made the little noses out of moldable clay and baked them. There was a little hole at the end so you just had to sew it on...brilliant. I love him! He's a keeper. My first reversible quilt- )$(@*&@&()@ - quilted! I had this quilt brought to me to longarm and was terrified when I first looked at it because the quilter wanted it quilted as a reversible. It was actually 2 quilts and she wanted it quilted together. I guess I just worry too much....like what about the extra thickness of points on the front as well as the back, will the machine needle be able to handle the thickness, what about lining it up perfectly, front on back and making sure it's square.....After fretting about it and explaining that I would do my best, it turned out beautiful. I love the ABC print and the color combination....cute as a button! This is a little mini 12X12 quilt I designed to fit the Ackfeld tabletop hanger. I like it lots, reminds me of when my mom hung clothes on the line outside. The fabric for the mittens looks like knitted wool which is really cool and I used blanket fleece for the cuffs. Since I'm rather lazy when it comes to hand embroidery, I machine embroidered the lettering with my machine. All done and just waiting for the snow to fly!